In the summer of 1846, the Army of the West marched through Santa Fe, en route to invade and occupy the Western territories claimed by Mexico. 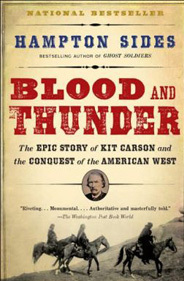 Fueled by the new ideology of “Manifest Destiny,” this land grab would lead to a decades-long battle between the United States and the Navajos, the fiercely resistant rulers of a huge swath of mountainous desert wilderness.In Blood and Thunder, Hampton Sides gives us a magnificent history of the American conquest of the West. At the center of this sweeping tale is Kit Carson, the trapper, scout, and soldier whose adventures made him a legend. Sides shows us how this illiterate mountain man understood and respected the Western tribes better than any other American, yet willingly followed orders that would ultimately devastate the Navajo nation. Rich in detail and spanning more than three decades, this is an essential addition to our understanding of how the West was really won.